A truly wonderful phone that you'll want to own, but the fingerprint reader frustrates. A whole year on and the Samsung S9 and Samsung S9 Plus have landed and they've made a big impression, winning T3's prestigious Best Phone award at Mobile World Congress 2018. We loved both the Galaxy S9 and Galaxy S9 Plus on review, stating that they were refined, polished versions of Samsung's Galaxy S8 and Galaxy S8 Plus smartphones. However, we also stated how in many respects - and especially in terms of specs - the two series of phones were actually very, very similar. Both, for example, share the exact same lush Super AMOLED screen, as well as similar RAM and storage specs. As such, the S8 range remains an incredibly powerful and, more so than ever, affordable smartphone that offers 90 per cent of the S9's experience and capabilities. Simply put, if you are in the market for a new Android phone you'd be a fool not to consider it. Here is our awesome original review, which hopefully will help you make up your mind if the S8 is the phone for you. So here we are: this is the long-awaited Galaxy S8. The headline is that the screen now takes up a whopping 85 percent of the front of the phone, meaning Samsung has dropped both its branding and the home button from the front. Huge thanks to the great people at Three for their help with providing the handset for this review - check out all of Three's Galaxy S8 deals and tariffs. Although, broadly speaking, we prefer the larger Galaxy S8+, the two handsets have reviewed very similarly, with both achieving a highly commendable rating of 4.5 stars. That's because the pair are pretty much the same apart from the larger 6.2-inch screen size for the S8+ as opposed to the still-fairly-whopping 5.8-inch display on this standard S8 handset. The S8+ also a slightly bigger battery (3,500mAh versus 3,000mAh) and costs £90 more SIM-free. With the S8 series, Samsung has basically taken the Galaxy S7 edge, beefed up the display considerably, changed some of the other specs, moved the fingerprint reader to the back, shoved the home button under the screen thanks to a new pressure sensor, added an extra button to the side of the phone for its Bixby personal assistant and released the phone in two sizes. More on all that shortly, but essentially what you need to know is that buying an S8 or S8+ won’t be a bad decision; these are superb devices that are worthy successors to the super S7 Edge. There are many who would love to have vanilla Android on the S8 and formerly the S7 edge. More so now than ever, we feel this call is misplaced. Samsung's TouchWiz overlay is better than ever and these days has a slickness that feels like you're always in control. It can be as complex or as simple as you want to get. The swipe up from the home screens to get to the app drawer is a particular highlight. The 5.8-inch Quad HD + 2960 x 1440 Gorilla Glass 5 display clocks in at a whopping 570ppi – comparable to last year’s S7 - and is significantly bigger than the 5.1-inch S7, 5.5-inch S7 Plus and iPhone 7 Plus. It even outsizes last year’s Galaxy Note 7 (yes, we know, we don’t need to say it) by 0.1-inches. As with the S8+, it doesn’t feel as big as it should (148.9 x 68.1 x 8mm) because of the lack of bezel. The aspect ratio has changed from 16.9 to 18.5:9, which is very similar although slightly different from the LG G6 (5.7-inch display 1440 x 2880 pixels). Like the LG G6, the handset is Mobile HDR Premium certified. It’s also 0.4-inches smaller than its sister, the Galaxy S8+ but crucially it can offer the same WQHD+ resolution. By default, the S8 is set to FHD+ resolution, but you can easily switch it to WQHD+ in settings. As you can see, the lack of bezel is most noticeable at the bottom of the screen, where there's now no home button; it's been replaced by the standard three Samsung controls on screen. But the design of the back edges (no pun intended) aren't a huge leap from the S7; it's a mere 0.1mm thicker than its predecessor. Because of the balance between body and display, there is no way this phone feels like it has a 5.8-inch display. It feels and looks fantastic and there's no doubt it's an impressive device to look at, even if the rear isn't exactly distinctive. Where the screen excels is in terms of apps, where scrolling through tweets, Facebook posts or webpages is a pleasure. You can snap windows to the top and bottom of the screen as with older Samsung handsets. The problem is that video content isn’t optimised for it, so most of the time you get black bars at the sides of the video content, although YouTube will try and adapt to the screen. This is OK but you can lose some content at the bottom of videos if you stretch them. But most of the time, YouTube content reasonably optimised. So we mentioned before that there are some issues with the Galaxy S8, and here we come to the first of them. As the home button has now disappeared into the display, the fingerprint reader has been moved to the back. Now, this implementation is no good if the phone is lying flat on its back on a desk. But we think rear fingerprint readers are generally fine and we really like Huawei’s implementation on the Nexus 6P, P9 and Mate 9 where the reader is set away from the camera. In other words, it’s easy to find it with your finger. Unfortunately this isn’t the case with the Galaxy S8. The reader isn’t anywhere near pronounced enough on the rear of the phone and the experience with it is very poor. It’s too high up the phone for one thing and worse still, you often smudge your finger across the camera lens (Samsung knows this could be an issue because it tells you to be careful about that in the fingerprint setup). Even though the camera is stepped out of the case and the fingerprint reader is stepped in, you just can’t find it accurately enough EVERY TIME and there are often read errors because you don’t cover the sensor correctly. We thought we’d get used to it, but we haven’t yet. Perhaps it didn’t want to put the reader lower on the back because that’s what Huawei tends to do (although it’s interesting that Huawei has dumped this implementation for the P10 and P10 Plus). 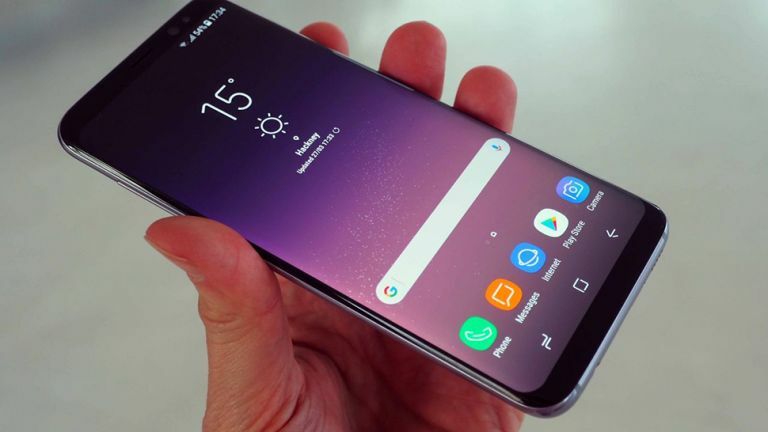 Some reports have surfaced stating that Samsung really wanted to have the fingerprint reader as part of the screen on the front and it was only placed on the rear when this became impossible to do within the launch timeframe. This seems plausible, but even so it’s strange the implementation isn’t better. The other biometrics aren’t much better. The improved iris recognition isn’t bad (although fails to work EVERY time) and you can enable it to invoke directly from the lock screen. However, it can be almost as quick to put in your PIN rather than hold the phone steady and stare at the phone. Face recognition is less secure because there is the potential that it can be duped with a photo, but it is still too hit-and-miss. If you’re in a room with decent light, we found it worked quite well and in anything less was next-to-useless. Can you really be arsed to assess the ambient conditions before you unlock your phone? As you’d expect, the Galaxy S8 sports another octa-core processor, this time in the shape of a 2.3Ghz variant. In Geekbench, the handset comfortably outperformed the Galaxy S7, Note 7 and S7 edge as well as the OnePlus 3 for both single-core and multi-core performance. The storage is 64GB, though unlike the S7 there’s no 32GB version. The S7’s microSD slot stays, so you can expand the storage significantly. 4GB of RAM is also on board, just like last year’s models. We’ve heard there may be a 128GB version at some point, though this hasn’t been confirmed to us by Samsung. An extra button on the left of the phone (you can also swipe across to the left) activates Samsung’s Bixby personal assistant, which uses technology acquired from startup Viv last year. Interestingly. Viv was actually from the makers of Siri (which Apple bought rather than created). That was only in the Autumn, so it could well be one of the reasons we didn’t see the Galaxy S8 surface a month ago at Mobile World Congress alongside the rather excellent 5.7-inch LG G6. So why the button? Samsung was keen that Bixby wasn’t like other personal assistants where you have to call the assistant to order – it wanted to avoid a key phrase like ‘OK Google’ or ‘Hey, Siri’. The problem is that those keyphrases are useful for handsfree operation of the phone and as people get used to instructing their devices from afar, surely a keyphrase is necessary? It’s understandable why Samsung wants to get into having an assistant, but let’s not beat around the bush – surely most people would prefer to use Google Assistant. That’s not actually going to be difficult - Google Assistant is there on the S8 and S8+ - just press and hold the Home button. Yep, the battle of the assistants will take place on the same device. Samsung says it has included the Google Assistant to give you the choice of which one to use. YouTube is already alive with a myriad of how to videos that show you to how to re-map the Bixby button to Google Assistant or another app or command. You can access a Bixby screen to the left of the home screen on the S8, which is so, so similar to Google Now. It even has ‘cards’ you can customise. You can set time or location-based reminders, too - just like Google Now. Bixby Vision is rather like Google Googles, enabling you to search to do a shopping search for things you take pictures of, or find images of the item online. This works…kind of. Matches are REALLY hit and miss, but we did have some success and it scans barcodes just fine. The handset is Bluetooth 5, so it is able to stream to two speakers or two sets of headphones simultaneously with independent volume control. This worked brilliantly streaming to a Naim speaker as well as to a pair of Plantronics headphones and while you’re warned that the synchronisation might be different, this wasn’t a problem for us. Talking of headphones, the headphone jack remains, while charging (including fast charging) and wired data transfer is via USB-C. The primary camera is a 12MP f/1.7 dual-pixel snapper with the same core specs as last year’s S7. That’s not necessarily a bad thing since it the S7 and S7 edge cameras were among our favourite smartphone cameras of 2016. As you can see from our sample images below, we got some great images from the camera with very strong colours. These images have not been colour corrected in any way, although they have been cropped for use on T3.com. Camera startup time and image quality remains superb with the S8, although we still don’t think it’s the easiest to use to access some of the settings. The secondary camera has been upgraded from 5 to 8MP with Smart Autofocus. What's in the Galaxy S8 box? There are some nice extras in the box. First you get AKG/Harman-tuned headphones since Samsung bought the audio company last year. You get some extra ear tips, too. The headphones are surprisingly comfortable and resist tangles to a point. But the sound is pretty flat and lacking in bass. You’ll be reaching for a beefier pair of headphones in no time at all. There’s also the increasingly-standard USB-C cable and charger plus two adapters – one to take a standard USB cable from another device for data transfer (see below in action) and then a microUSB adapter so you can convert any older charger to USB-C. The battery is 3,000mAh so smaller than the 3,500mAh battery in the S8+. It's the same size as the one in last year's Galaxy S7. Thanks to fast charging, you can get it to around 50 percent in around 40 minutes and charge the whole thing in around an hour and a half. You do need to use the official cables and charger, predictably. You can get pretty much the whole day from the Galaxy S8, but you'll need to work at it by turning all the bells and whistles off. You'll need to dial down the resolution and brightness as you’d expect (and then there’s the Always On display to turn off, which will give you a few extra percent). Otherwise expect to be charging it by the evening if you had a full charge when you woke up. That's with proper use, obviously if you're not on the web, listening to music and sending messages throughout the day then it'll last until bedtime. If you're a regular T3.com reader, you'll know that price isn't really a driving factor for us. But it's fair to say that the S8 lineup isn't a budget option. As competition increases across the year - and especially towards the launch of the new iPhone in September - the S8 will become a much more attractive option. In the UK, the Galaxy S8 will retail at £689 and the Galaxy S8+ will retail at £779. That’s a significant price step-up from the £599 and £719 price points of the iPhone and iPhone 7 Plus. Now that’s not comparing apples with Apples, because the standard S8 is still bigger than the 7 Plus. And the S8 models come with 64GB of storage, double that of the standard iPhones. There will be three S8 colours to choose from at launch, black, grey and silver, although the silver won’t be here for UK launch apparently. A blue model of the S7 appeared, so expect a special edition at some point. And, although it seems regular now (though not for the Google Pixel or Huawei P10 series), this Galaxy is also waterproof and dustproof. We love the Galaxy S8. It's an incredible smartphone, but there are caveats - not least that terrible fingerprint reader. It’s also not a wallet-friendly choice, but then neither is it intended to be. What it is intended to be is one of 2017's best smartphones. And on that score, it's a total winner.